Harry Potter And The Order Of The Phoenix (which, for the rest of this review, will be referred to as "Harry Potter OOTP") has a detailed, stylized look with a simple menu format. "Multiplayer" is right on the main menu and "Single Card Play" follows on that menu. There is a long opening credit sequence, most of which can't be skipped. The download times are pretty quick, however, at around 25-30 seconds. While the menus are charted well and legible, the options are very small and close together. While they can be navigated with the buttons, fans of touch screen navigation will find navigating the menus cumbersome. The easiest way to discuss the gameplay is to talk about each activity individually. In Chocolate Frogs, you tap moving (hopping) frogs. If your aim is good, the game's reaction is good. If Gobstones, rolling "rolling" or "tossing" liquid-filled marbles (gobstones) towards concentric circles with a hole in the center. The aiming aspect is good, but the ability to determine how much power is used in each roll (/toss) - based on how hard you send the gobstone with the stylus's movement - doesn't react quite as well as it could have. The distinction is there between a hard throw and a soft throw, but a hard throw versus a not-quite-so-hard throw misses out on sufficient distinction. In History Of Magic, you can tap on the answers OK, but the border between one answer and the next isn't always the line separating them (like it should be) and you occasionally end up with a wrong answer even though you tapped the correct one (or at least you thought you tapped the right one). Finally, the control in Potions worked almost flawlessly and acted exactly as expected. Harry Potter OOTP is a beautiful-looking title that features several 3D elements, all of which look good. The audio consists of sound effects that help, but are by no means necessary. The overall effect on Chocolate Frogs is good (but a little too dark in terms of brightness). Potions is probably the most flawless. Gobstones is the closest to a "true game" on the list. History Of Magic is a little hard to deal with (the cursive font is not the clearest you'll find). All of these games are well and good, but more would have been nice. Or anything with any depth. The programmers did a nice job setting up the Single-Card Download features as a demo for single player gaming (in addition to the multiplayer gaming), but the selection of what's playable doesn't quite match up to their intentions. The game looks great and plays (for the most part) without significant error. The problem is that after a few minutes, you'll be out of things to do. Potions, while different each time, plays almost identically regardless of what the ingredients are that are being included. History Of Magic is Harry Potter trivia. Some of it is answerable if you haven't read the books or seen the movies, but much of it isn't. Chocolate Frogs is, well, tapping. Gobstones plays like shuffleboard. The best depth would be Gobstones when played against a human you can talk smack with, but there isn't a lot to keep drawing you back. The mini-games aren't bad, they're just not that riveting. You'll probably play for a little while ad enjoy yourself... before getting board and deciding to play something else. I'm glad the designers put so much thought into the Single-Card Download aspect of multiplayer gaming and its layout for the title. It's a good first attempt (better than some others). Now, let's just improve the mini-games themselves for the next Harry Potter title. Permit players to skip the opening credit sequence. Space out the menu options and set up some buffer space between selections. Encorporate depth in gameplay for at least one mini-game. Allow for demo-vs-demo multiplayer gaming. 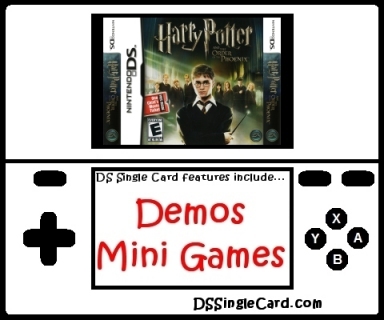 Click here to return to the DSSingleCard.com Harry Potter And The Order Of The Phoenix profile.